The weather is finally starting to cool down and the leaves are beginning to change color, which means we’re easing our way into the cooler fall and winter months in Merrimack Valley. With that change in the seasons, a lot of homeowners will start turning on their heating systems for the first time in several months. 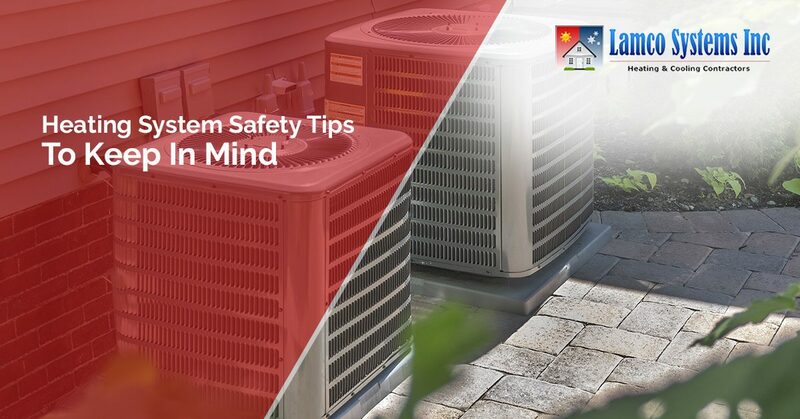 In order to stay safe from any home fires or fire-related deaths, we’re providing you with a few heating system safety tips to keep in mind in this blog post. At Lamco Systems, Inc., we offer an array of heating services to the Merrimack Valley community, including installation, maintenance and repair services. We even offer emergency repair heating services for when your furnace inconveniently breaks down in the middle of the night. Whatever heating service you may need, our HVAC technicians will provide you with the best quality of work and professionalism. Contact our team today for a free quote. Below, we’ve listed a few heating system safety tips that will keep you and your family safe as the weather continues to get chillier. Schedule routine maintenance check-ups for your heating system. The best way to ensure your heating equipment is working the way it should be is to get it thoroughly checked by an HVAC professional on a regular basis. It’s important to take a preventative approach with your heating system, as emergency repairs are usually more costly than regular maintenance work. Remember to turn off portable or mobile heaters. We understand the energy efficiency of having a portable or mobile heater, but you need to ensure you turn these heaters off when they are not in use — especially whenever you leave the room or doze off to sleep. Always monitor your heating systems for ultimate safety. Follow basic heating equipment safety rules. Don’t use your oven to heat the entirety of your home. Always use the correct kind of fuel in your burning space heater, usually specified by the manufacturer. Keep any children at least three feet away from open fires or space heaters. Test your smoke alarm batteries about once a month to make sure everything is working properly. If you’re unsure about something when it comes to safety and your heating equipment, don’t hesitate to reach out to our HVAC professionals at Lamco Systems. We’ll be more than happy to help! In Merrimack Valley, it can get extremely cold in the fall and winter months, which is why we rely so heavily on our heating systems during this time. At Lamco Systems, we want to ensure you and your family stay safe while also staying warm and comfortable. We’ve offered top-notch heating services and excellent customer service since 1967. Contact us today for your next heating service. You can reach us by calling (978) 674-8837 or by completing our online form.